NETWORK FINALS: LAST MAN STANDING gained 0.1 in final numbers. CABLE HIGHLIGHTS: Friday cable was a grab-bag of genres. Discovery’s GOLD RUSH led the night, up 0.05 to 0.94, with lead-out TREASURE QUEST up 0.04 to 0.44. A pair of Nickelodeon shows hit the Top 10, with primetime’s HENRY DANGER at 0.58, and the afternoon’s PAW PATROL at 0.47. They were joined by two morning Disney Channel shows, LION GUARD at 0.43, and SOFIA THE FIRST at 0.42. Sports was represented by Fox Sports 1’s US vs. Mexico WORLD CUP QUALIFIER at 0.56, which tied ESPN’s Indiana vs. Kansas COLLEGE BASKETBALL game. The season finale of HBO’s REAL TIME WITH BILL MAHER gained 0.05 to 0.53, and TRACY ULLMAN’S SHOW was steady at 0.16. For Fox News, the 2016 election is a so-far unending annuity, with THE O’REILLY FACTOR leading the brigade at 0.52 (and 4.6M total viewers). 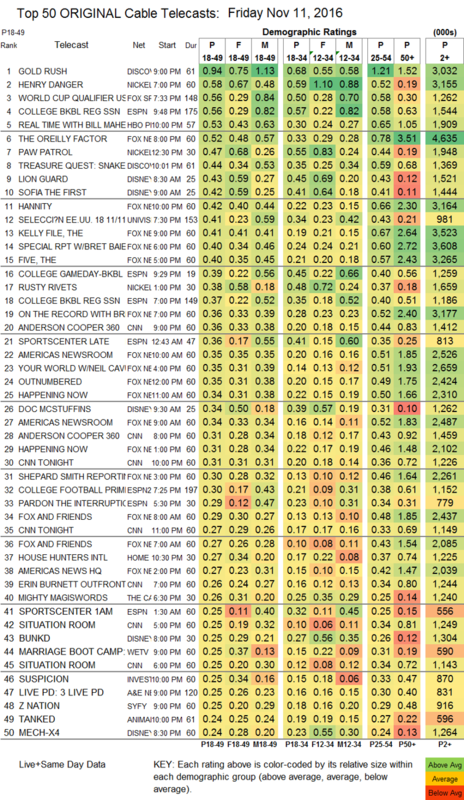 HGTV’s HOUSE HUNTERS INTL held at 0.27, and HOUSE HUNTERS was down 0.05 to 0.23. On We, MARRIAGE BOOT CAMP climbed 0.04 to 0.25, and MY LIFE IS A TELENOVELA held at 0.05/142K. A&E’s LIVE PD edged up 0.02 to 0.25. On Syfy, Z NATION ticked down to 0.25, and VAN HELSING was up 0.02 to 0.17. Spike’s BELLATOR LIVE was steady at 0.20. 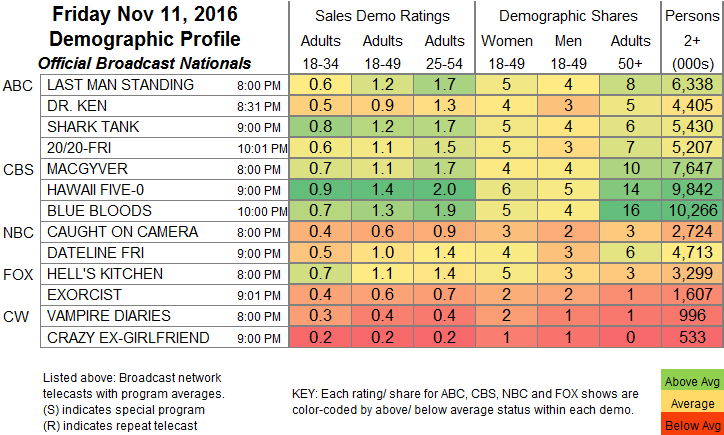 TLC’s KINDRED SPIRITS ticked up to 0.19, and A HAUNTING was up 0.02 to 0.17. OWN’s FOR BETTER OR WORSE remained at 0.17. History aired 4 hours of THE WARFIGHTERS at 0.12/0.12/0.14/0.14. IFC’s 2 episodes of COMEDY BANG BANG were at 0.03/85K and 0.01/44K, below last week’s 0.05/0.03.